We are all tired of the snow and cold temperatures we've had so far this winter, so let's discuss what is happening in the late winter garden to change our outlook. There are a number of shrubs and plants that have their hayday in this season - blooming when nothing else seems to be happening. 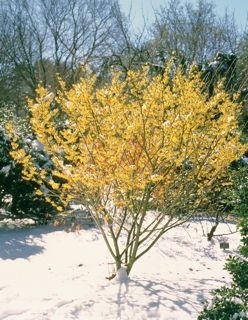 One of the most interesting is the Witchhazel or Hamamelis x intermedia. There are a couple cultivars that are popular in the Mid-Atlantic that provide the best blooms and are very fragrant. One is "Arnold's Promise" which has a bright yellow flower which looks like crinkled bits of ribbon. Another cultivar, the second one below, is "Diane", which has the same ribbon-like blooms but in this case they are a vibrant red color. These can be seen right now at Green Spring Gardens Park in Alexandria, VA.
Jasminum nudiflorum or Winter Jasmine is another shrub that blooms with bright yellow flowers in the late winter or early spring. 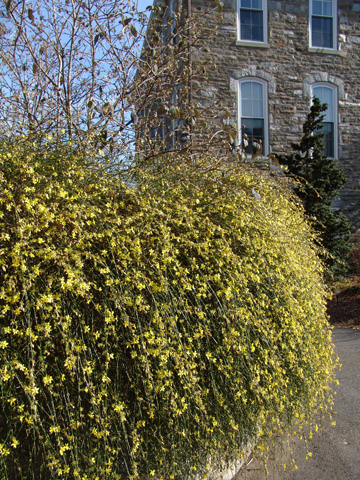 It has long green stems that have a cascading habit and develop yellow blooms all along the stem - looking a bit like forsythia but at a much earlier time. One beautiful place to see these in the area is at Dumbarton Oaks in Washington, D.C., the estate of Mildred and Robert Woods Bliss designed by landscape designer Beatrix Farrand. 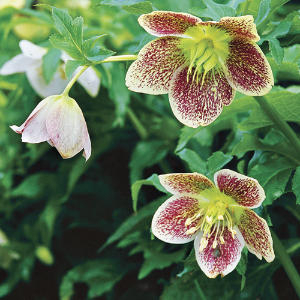 A lovely plant for late winter and early spring is the Lenten Rose (Helleborus orientalis). It is beginning to bloom right now and there are all kinds of interesting colors of hybrid blooms available. Another great characteristic of this plant is that the leaves are evergreen. Once the new blooms come out, the leaves do turn brown on the edges and can be cut away to reveal the beauty of the blooms alone. As spring begins new leaves will grow into place. Deer do not find these plants at all enticing so they are great for gardens that have these wildlife visitors. 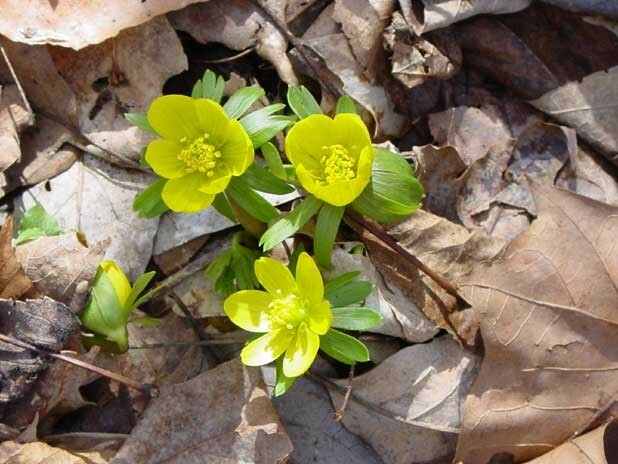 Winter Aconite (Eranthus hyemalis) is one of the earliest blooming spring perennials. It is in the buttercup family and has small yellow flowers. It is a very low growing plant that does well in rock gardens, flower beds, and woodland gardens. They are great for naturalizing but can spread easily and become somewhat invasive. They can be controlled by digging up large clumps. These can also be seen at Dunbarton Oaks during late winter and early spring. 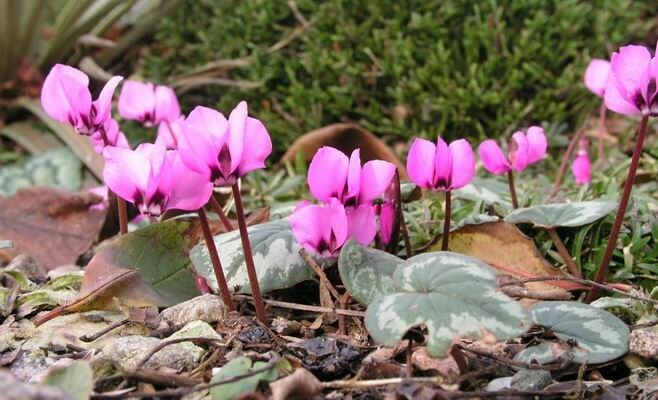 Cyclamen coum or Hardy Cyclamen is native to the Mediterranean region and provide some beautiful blooms at this time of the year even when there is still snow on the ground. It blooms in warm pinks and reds that look great in the snow. Once the blooms are gone the foliage has an interesting silvery grey and green color that makes a nice ground cover. They do best in dry shade so it is good to plant them under deciduous trees that provide winter sun and summer shade.